In this area of Washington, our rain is often just a mist or light rain but occasionally we have strong winds that reach tornado like speeds any time of year. Considering that most American homes are topped with asphalt shingles, they may be vulnerable to damage once another tornado like windstorm strikes. Given these considerations, homeowners need to have roofing materials that are highly resistant against harsh environmental elements. A slate roof is made up of shingle-like slate stones laid onto a roof. 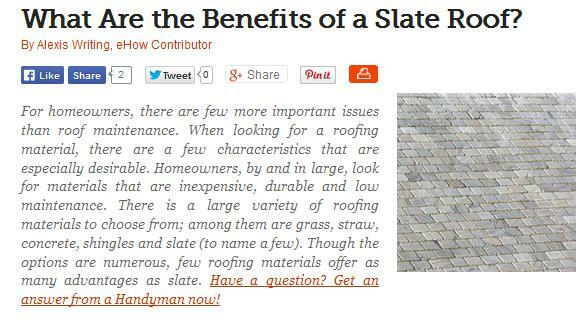 One main benefit of a slate roof is that it provides the house with a very natural-looking appearance. Unlike other durable roofing materials, such as tin or concrete, which can sometimes be eyesores, slate has an aesthetically pleasing look. Additionally, slate can be obtained in variety of natural colors, allowing for an easily customized look. Slate is a heavy material which weighs between 800 and 1,500 pounds per square (100 square feet). Most Des Moines roofing experts would probably tell you that insufficient reinforcement in the attic will cause the tiles to break, which is why a stronger roof framing and sheathing will be needed to prevent the roof from flexing. In the unfortunate event that some of the tiles get broken, it can be a challenge to find the exact match since these tiles run by different lots. While the initial cost may be 10 or 20 times more expensive than conventional materials, homeowners could actually cut back on repair and replacement expenses. Moreover, it offers relative ease of maintenance since you will only have to clear the roof of leaves and branches. You can also take delight from the fact that its aesthetic appeal does not age with time, nor will it fade under the sun’s harmful rays. Slate cracks easily when stepped on so it would be impractical to install it yourself. It’s better to hire seasoned Des Moines roofing contractors to ensure the utmost care in putting a secured roof above your head. Bear in mind, though, that you have to ask for product warranty and a written estimate of their service for documentation purposes. On the whole, the optimum performance of slate roofs relies heavily on installation. Don’t entrust your roof’s safety to anyone else. Choose established names like Tedrick’s Roofing Inc. for a worry-free workmanship.